Our range of products include Bresser Venus 767 Parabolic Reflector Telescope, Bresser Junior Dia-70 - Fl-700 Ng Sky Refractor Telescope, Bresser Galaxia Dia-114 - FL-900 675x EQ Telescope, Galileo Skyview III - Refracting Telescope for the, Skyview IV - 70mm AZ Refactor Telescopes and Skyview80 - 80mm EQ3 Refractor Telescope 675x. The Venus reflector is our all-time bestseller. The coupling of classical design and affordable pricing make this telescope the perfect entry item. Its altazimuth mount exemplifies the simpleness and allows the observer to point the optical tube in all directions without any hassle. Very easy in handling, especially for beginners. Junior Dia=70 / FL=700 NG SKY refractor. Observing the stars like a professional - very easy with the refractor telescope 70/700 NG. This refractor telescope with 70 mm aperture can show many details in celestial objects. The 8845000 is a complete system for the exploration of the wonders of the universe, consisting of telescope, mount, tripod and all accessories needed. The mount can not only swing the telescope left / right and up / down, it can also be used in a so-called equatorial mode, as scientists do in their observatories (see further under Special features).An additional finder scope mounted on the telescope is useful for locating celestial objects. With the erecting lens during the day many exciting things in the environment can also be seen. With the height-adjustable tripod, the telescope can each be brought to an optimal height for large or small observers. The supplied diagonal mirror ensures a comfortable viewing. At night the moon and planets may like Saturn and Jupiter can be explored. But thanks to the 70 mm wide aperture of the telescope also many celestial objects outside our solar system are within the reach of this telescope. Star clusters many light years away and fog impress young and old star gazers. The included erecting prism to get a true sided and upright image during the day enables this telescope to be used for the observation of nature, for example. Mounting with wedge: At first glance, the NG mount for the refractor telescope 70/700NG is a very ordinary azimuth mount: an axis for left / right and one for up / down, as we know it from normal camera tripods. This mode makes sense especially with observations during the day. With the built-in wedge it can be tilted, so the whole mount can be converted to an equatorial mount for astronomy with a single operation. For use of the equatorial mount an axis is aligned with the North Star. When tracking a celestial object only a single axis needs to be moved, which clearly is a relief compared to tracking an object on the night sky with mounts that only have left / right and up / down axis. Its large mirror diameter allows for excellent light collection. The eyepiece holder with one of two included eyepieces is attached to the side of the telescope tube and allows for easy viewing. The top quality equatorial mount adds to the professionalism of this telescope and lets the user perfectly align the telescope with the viewing object. Explore the planets within our solar system and discover new worlds. The included astro software lets you compare what you see on your monitor with the night sky. An excellent learning and discovery tool. The superiority of this telescope can be complimented with the numerous optionally available accessories from BRESSER. “I propose great things for inspection and contemplation by every explorer of Nature,” wrote the famous astronomer Galileo Galilei in 1610 after probing the heavens with his crude, self-made telescope. Those “great things” he mentioned are still up there, ready for today’s budding astronomers young and old to inspect and contemplate. You can see them for yourself with Our Skyview III, which, believe it or not, is a far more capable telescope than Galileo ever had! 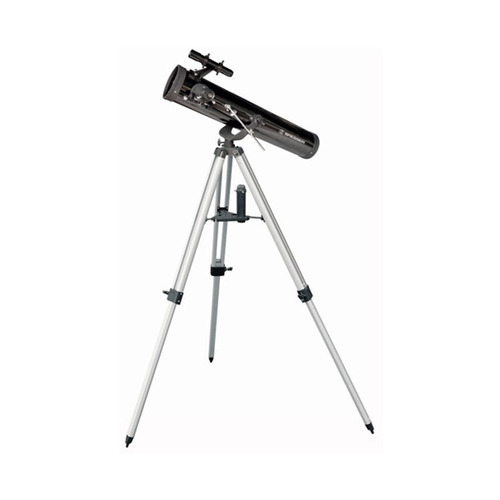 The Skyview III is a classic refractor with precision glass optics and great portability. It’s a complete backyard telescope package that includes the optical tube, all accessories, and tripod. You’ll be surprised at the celestial sights you can see with Skyview III. Saturn and its rings, Jupiter and its dancing moons, and the changing phases of Venus, for starters. Close-up views of the Moon’s rocky, cratered surface. The contrasting blue and gold gems of the double star Albireo. And dozens of “deep-sky” gems, including the magnificent Orion Nebula and the glittering Pleiades and Beehive star clusters. Everything You Need To Begin Stargazing! The economical precision optics of the Skyview III reveals Moon craters, rings of Saturn, star clusters, and more. Fun and easy to use for kids and adults! The Skyview III telescope offers higher quality and more reliable performance than department store refractors. Ours features weather resist PVC tube and all-glass optics, including a fully coated 60mm achromatic objective lens for crisp, bright images. It comes with three eyepieces: quality 20mm, 12.5mm, 4mm lens gives you a magnification of Upto 525x With 3x Barlow provided . To top it all, there is a finder scope with cross hair to help you locate your targets. A sturdy mount with heavy duty tripod gives you steady images without any vibrations. Light weight, Weather resists. Its small, compact size makes it an excellent companion for kids and adults alike. The Skyview III comes on an altazimuth mount. The altazimuth mount is lightweight, and easy to operate. This refractor telescope features an impressive optical and mechanical quality that translates into a great visual performance on the field. And it comes complete with all the tools that will enable you to maximize your observations. Features Quick-release fork arm mount, optical tube, sturdy tripod and accessory tray for quick no tool set up for quick and ease of use. Furthermore this telescope also comes complete with a heavy duty focuser as an additional value. AZ fork Mount with Manual Slow motion. Magnification with supplied eyepieces 175x, 70x and 28x. Focuser diameter RACK-AND-PINION Focuser .9 ". Diagonal 90 Degree Zenith -Erect Image Diagonal - 1.25"
Focuser diameter RACK-AND-PINION Focuser 1.25"
Diagonal 90 Degree Zenith Diagonal - 1.25"
Resolving Power 1 Arc - Seconds. Focuser diameter RACK-AND-PINION Focuser 1.25". Resolving Power 0.9 Arc - Seconds. Size :14mm diameter tube x 125mm length (235mm) when extended. Focus 20" to infinity. (fits in your pocket like a pen). Use as a Microscope, Penscope magnifies fine details to 25x. Draw out the chrome finished focusing tube and you have a 10x Telescope to spy distant objects. TELE - Micro Penscope features high quality Optical Glass lence, Stainless steel tube body. Our classic brass hand telescopes recall the days when the ships that sailed the high seas did, quite literally, sail. Today these expertly handcrafted viewing instruments let you survey ocean-going vessels from the shore or peer in on adistant nest from the porch. Each has glass optics contained in a sectioned tube of polished brass that extends for viewing and collapses for convenient, compact storage. Display it in the den or on living room hearth when not in use, either inside or outside of its genuine mahogany storage chest. It will ll get the attention of anyone who sees it! The smaller of the two scopes, this one features strong 10x magnifying power and a 25mm objective lens. Sharp focus is achieved by sliding the eyepiece section in or out. Extended length, 14"; collapses to 5.5". 30x High Power Handheld Pocket Telescope - Bright Images, Solid Construction, Right Price! Look there! Perched on that Mexican pinyon tree across the arroyo. Is that a red-tailed hawk or a red-shouldered hawk? Binoculars aren't helpful; this bird is too far away. What you need is the magnifying power of our stout SS30 High Power Handheld Pocket Telescope. This scope is not only well made, but also falls in one sweet spot of a price range compared to other scopes of its size. Fully worked optics, 25mm Achromatic objective lens for bright images. The built in glare shield improves contrast on bright days. Unique erector system, which eliminates Eyepieces and gives straight images. Simple slide in focusing system for easy and faster usage. Instruction manual to take care of rest! What's even more unique about this scope is its stay-on and most importantly tech support from Galileo. Whether you're checking out mallards, mule deer, or just enjoying a mountain tableau, the Arcadia can get you as up-close as you want! Its perfect companion for hunting, sailing and sporting events. Small enough to fit in your pocket! Quality Steel body construction, Fully worked optics, 25mm Achromatic objective lens for bright images. The built in glare shield improves contrast on bright days. Unique erector system, which eliminates Eyepieces and gives straight images. An attractive pouch well made from weather resists material. Simple slide in focusing system for easy and faster usage. Instruction manual to take care of rest.